UPDATED: It’s traditional for many Norwegians to sit down in front of the TV on New Year’s Eve and listen to the monarch address the nation, and then listen to the prime minister do the same on New Year’s Day. This year’s speeches weren’t particularly stirring, but they say a lot about what it means to be Norwegian. Fellowship, stability, confidence in one another, and the importance of a sense of belonging: Those were the themes touched on by both King Harald V and Prime Minister Erna Solberg, and millions around the country set aside their champagne glasses to listen. For the monarch, it’s the one time of the year that the king speaks directly to his subjects. For the prime minister, as newspaper Aftenposten noted, it’s the only speech of the year when he or she can speak diretly to the people, “without being analyzed, edited and dissected, or simply ignored.” Both the king and prime minister hailed ordinary Norwegians in their speeches, for their efforts to overcome barriers and contribute to society. This year’s prime minister’s speech, coming right after state broadcaster NRK’s nightly nationwide newscast, marked the 70th anniversary of the first one held by the legendary Einar Gerhardsen eight months after World War II had ended. The prime ministers’ speeches over the years are also the subject of a popular new 750-page book that covers them all, and what impressions they’ve made over the years. Gerhardsen of the Labour Party used them to help build up a nation ravaged by the five-year Nazi German occupation. So did many others, like Oddvar Nordli of Labour, who noted in 1977 that Norway was already “one of the world’s 10 richest nations” and that “we have built the country up ourselves with honest work.” Years later, Kjell Magne Bondevik of the Christian Democrats broke new ground by addressing the problem of bullying in the schools and being candid about his own mental health problems. Gro Harlem Brundtland of Labour uttered the memorable line that “it’s typically Norwegian to be good” in 1992, while Jens Stoltenberg of Labour will forever regret referring to his failed carbon capture plant at Statoil’s Mongstad refinery as what was supposed to be Norway’s equivalent of a moon-landing. Speculation had run high just last month over whether Solberg would survive a state budget crisis and still be the one to deliver this year’s New Year’s speech. She did, and held her fourth on Sunday night in which she repeated the word that won her credit for creating the “new word” of 2016, hverdagsintegrering. She uttered it again, as she urged people “lucky enough” to find themselves a passenger on board a bus driven by Norway’s first Somalian female immigrant to smile to Aisha Ali Mohammed, and thereby contribute to everyday integration. The mother of three, Solberg noted, has been criticized within the Somalian community for “doing man’s work” and wearing trousers to work, while also enduring criticism from Norwegians for wearing a hijab. She knows something about how hard it is to break through barriers, and Solberg made her a bit of a national heroine overnight. Solberg chose this year to also single out individual, ordinary Norwegians she met during the year who are making their mark, like Dr Christian Mide of Lofoten who has developed a new form of hypodermic needle that’s now being sold worldwide, and nurse Mohsen Jamei of Gjøvik, who by simply extending meal hours at a local nursing home helped make sure elderly patients ate well and more, gained energy and weren’t undernourished. Solberg also cited the success of Jimmy Pedersen, whose Kafé X in Tromsø caters to people with drug addiction problems. 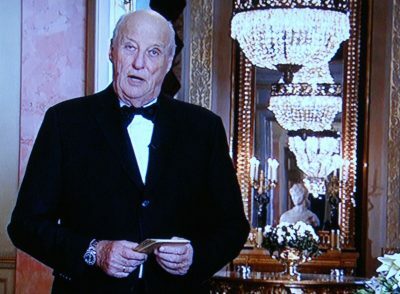 King Harald, in his speech, also talked about individuals making a difference in Norway. Police officer Jan Erik Bresil, for example, provided the monarch with “one of the finest wishes I’ve heard all year,” when Bresil told a young offender that maybe he was dreaming that he’d mend his ways, “but my dream starts with you.” That gave the young man in trouble something to think about. 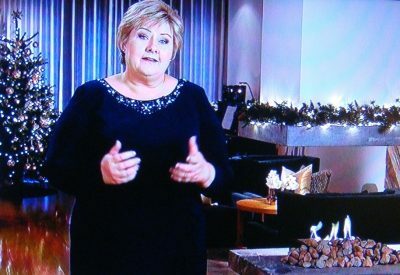 Solberg, facing a tough re-election campaign later this year, also used her speech to make a few political statements. She caught criticism Monday morning for hailing her own government’s success at finally normalizing relations with China and then saying that “we stand most securely when we stand together with other countries who share our democratic values.” Not many in Norway view China as democratic, and normalizing relations with China is widely believed to have been fueled mostly for trade and economic reasons. Otherwise Solberg’s speech was getting generally good reviews.